Although they both perform the same primary function, measuring tapes differ from rulers in that they are flexible and suited to measuring around and inside things, while rulers are good only for straight edges. Like rulers, measuring tapes come in a wide variety of different calibrations. 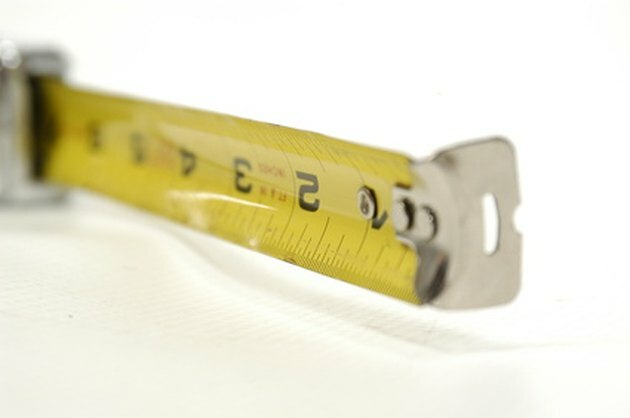 Although inches and centimeters are common on both, it is possible to get measuring tapes in "tenths," which measure tenths of a foot and are often used in building and construction. Even if you don't have a tenths-calibrated measuring tape, however, you can still indirectly measure length in tenths. Some measuring tapes are made of metal, others plastic. Purchase a measuring tape that measures in both tenths and inches if you want to measure distances in both units simultaneously. Visit your local hardware store and ask the associate to find you a measuring tape that is calibrated in both units. Measure your length in inches if you can't or don't want to obtain a measuring tape which is also calibrated in tenths. The relationship between tenths and inches is a fixed one, so you can mathematically convert the distance in lieu of measuring it. Convert your inches to tenths, keeping in mind that a tenth is one tenth of a foot, which is 12 inches--a tenth, therefore, is 12/10 or 1.2 inches. If you measure your water heater's circumference as 144 inches, for example, you can convert it to tenths as follows: 144/1.2 = 120 tenths.